Lies, lies, lies and more lies. In this jockeying for position, the only thing guaranteed is Leona Helmsley's Law i.e. "Laws and taxes are for the little people". But the little people are starting to fight back in the U.S. and we'll get to that after we do a quick review of the situation at hand and how we got there. In those days, the corner bank knew the customer, the house, the depositors, they kept the records in a file cabinet at the bank -- it was where you went in to make your payment. Everyone knew that If you didn't keep up with the payments, the banker would foreclose on your property. That part hasn't changed. In the 1980's, financial geniuses came up with a new product, a way for the investment banks to make money from a market they couldn't previously tap into in a big way -- the home lending business. As you can imagine, it's a huge market, in the trillions, and the way they approached this market was to convince the originating banks, those who process and write the loans, that they could get more access to cheaper money. This would let them write more loans, generate more fees and make more money by reselling the mortgage. It also eliminated a lot of the risk of the loan, since it was almost immediately resold. But buying an individual mortgage of several hundred thousand dollars wouldn't make sense for the large investors with billions to invest or the investment banks, so they packaged them together in bundles of millions of dollars worth of mortgages. Ginnie Mae guaranteed the first mortgage passthrough security of an approved lender in 1968. In 1971 Freddie Mac issued its first mortgage passthrough, called a participation certificate, composed primarily of private mortgages. In 1981 Fannie Mae issued its first mortgage passthrough, called a mortgage-backed security. In 1983 Freddie Mac issued the first collateralized mortgage obligation. In 1960 the government enacted the Real Estate Investment Trust Act of 1960 to allow the creation of the real estate investment trust (REIT) to encourage real estate investment. 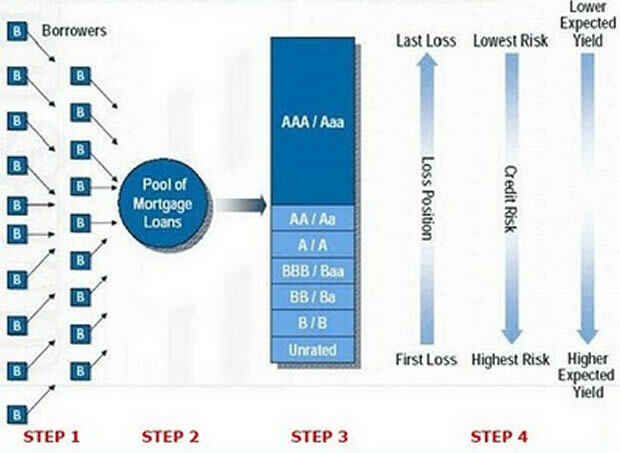 In 1977 Bank of America issued the first private label passthrough, and in 1984 the government passed the Secondary Mortgage Market Enhancement Act (SMMEA) to improve the marketability of such securities. The Tax Reform Act of 1986 allowed the creation of the tax-free Real Estate Mortgage Investment Conduit (REMIC) special purpose vehicle for the express purpose of issuing passthroughs. The Financial Institutions Reform, Recovery and Enforcement Act of 1989 (FIRREA) dramatically changed the savings and loan industry and its federal regulation, encouraging loan origination. The Small Business Job Protection Act of 1996 introduced the Financial Asset Securitization Investment Trust(FASIT) that is similar to the REMIC but is able to securitize a wider array of assets. Today, there are almost $9 trillion worth of mortgage related securities. Everyone got in a lather when the housing market completely tanked because the value of the MBS plunged. The ugly reality of the foreclosure market. "The purpose of MERS was to help in the securitization process. Basically, MERS directed defaulting mortgages to the appropriate tranches of mortgage bonds... legally [however]...andthis is the important part...MERS didn't hold any mortgage notes: the true owner of the mortgage notes should have been the REMICs. "But the REMICs didn't own the notes either, because of a fluke of the ratings agencies: the REMICs had to be 'bankruptcy remote,' in order to get the precious ratings needed to peddle mortgage-backed Securities to institutional investors. Even the sheriff is figuring this out. 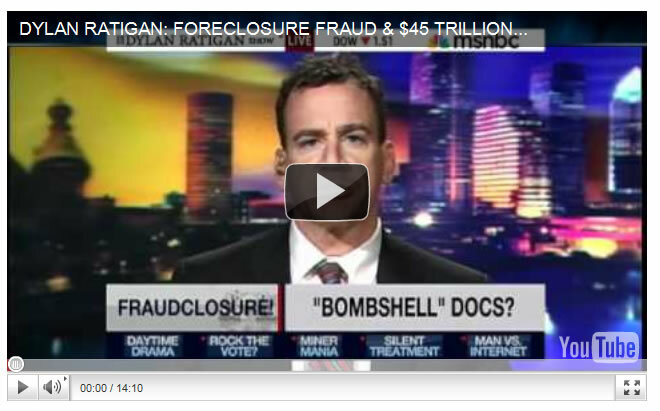 What happens when the sheriff refuses to do the foreclosure? "I can't possibly be expected to evict people from their homes when the banks themselves can't say for sure everything was done properly," Dart said in the statement. "I need some kind of assurance that we aren't evicting families based on fraudulent behavior by the banks. Until that happens, I can't in good conscience keep carrying out evictions involving these banks," he added. Now that the sheriff won't do the foreclosures, will the banks hire Blackwater (Xe) to breakdown the doors and throw the mortgage deadbeats out on the street. "Nobody in this country knows for sure who owns any real estate, residential or commercial." This is just the beginning. Expect to see more people take the law into their own hands and uncertainty of title causing massive damage to the real estate market, the banks and anyone else with their fingers in this tainted pot. That chain of title explanation doesn't sound right, but I'm not an attorney or real estate professional. I would think that the last signature on the note or IOU would determine who owns it, and the person taking the loan would not be off the hook. 30 Oct 10, 15:05 Banks not might be the winners! I was curious if any of know what the economic scenario will be if millions stop paying their mortgage, defend and win in mass, ending up with clear title to their homes and win the security of stable residence during economic decline and full ownership of their houses. What if the bankers lost so much economic and political control? I see a different economic policy emerging out of this and the US becoming poorer but at the same time this will change the rent to spending money ratio for those homeowners that win too so maybe this wouldn't be so bad.